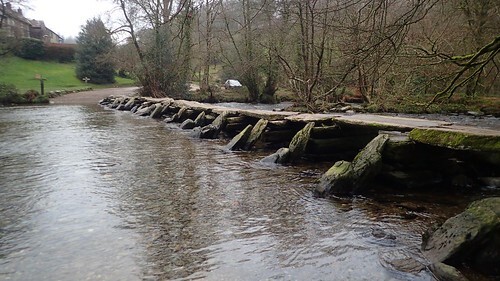 After several evenings of discussion and planning across social media, we settled upon the pay-and-display car park at Tarr Steps; infamous for its historic clapper bridge. We paid only £3 (£1 each) for the privilege of parking at this popular place with free toilets. I’d only been here once before and that was in the late summer of 2015. 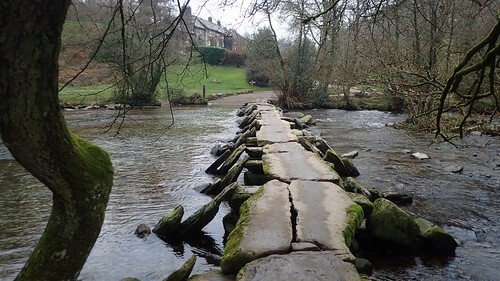 Since then, the clapper bridge has been washed away by the rush of the River Barle and then rebuilt by hard-working volunteers. I believe this has happened several times in the bridge’s history. 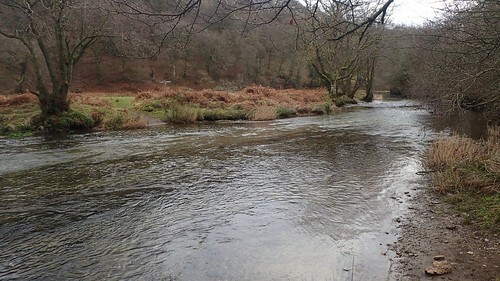 If you’re ever driving this way yourself, I’d strongly advise you to approach from the north-east (Winsford and Liscombe), unless your in a four-wheeled vehicle… As you’ll otherwise have to drive through this “ford” (the River Barle) to reach the car park, if approaching from Hawkridge! 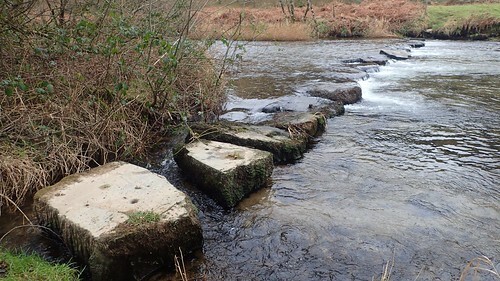 We’d talked about starting this walk from the village of Withypool, but had been unable to find anything other than “Somerset’s Smallest Car Park” as a starting point… So, our walk began, setting off in that direction; crossing the Barle along the substantial stone steps to follow the Exe Valley Way. 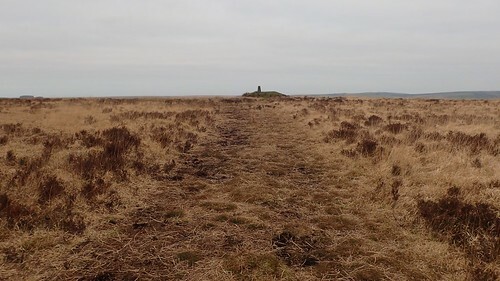 Initially, we were following the Two Moors Way, as according to the waymarking on the ground. Looking now, I can see that we didn’t actually join the Exe Valley Way until we reached Parsonage Farm. Staring solely at a map, where green lines with diamond shapes run close to each other… Distinguishing one long-distance path from the next can be a challenge. Early in to our walk and already, we were heading uphill. My friends were feeling out of shape but knowing they have a longer and more challenging walk to follow at the end of this month. Following Worth Lane up from Westwater Farm, turning left immediately after a cattle grid to tread on to Withypool Common. 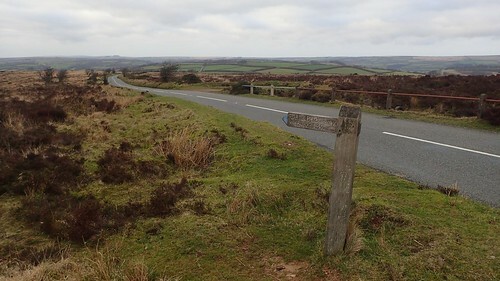 We’d turn back to cross Withypool Hill a bit later on. For now, I had another high point in mind. 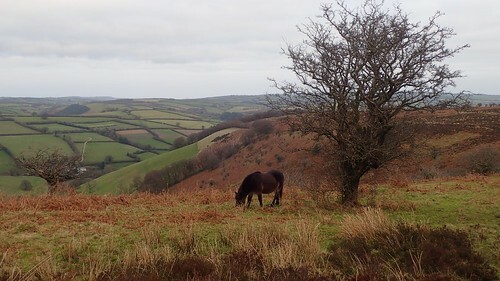 Having planned the route in advance, I’d decided to stick to the bridleways for much of this walk. It often reduces navigation and wayfinding in to much less of a headache. From memory, we passed only two horse riders and a small group of friendly cyclists. I recall following one “path” on the ground that didn’t quite marry up with what I was following on the map… But a quick check with the GPS on my phone saw us returning to our course. So, my objective was to lead us to the trig point at Brightworthy Barrows. As you’ll see in the screenshot above, there are apparently no tracks or paths leading up to this summit… But I was confident and determined to find a way to the top and ideally, without resorting to beating our way through the bracken and tussock-laden terrain. True to my faith and determination, we found a track across the road from the field corner beneath the italic text ‘Green Barrow’. We could follow this to the north and I was confident it was heading up the hill in the right direction. 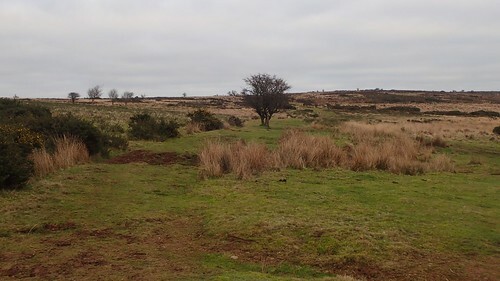 Another track also leads off to the barrow, closer to the road. 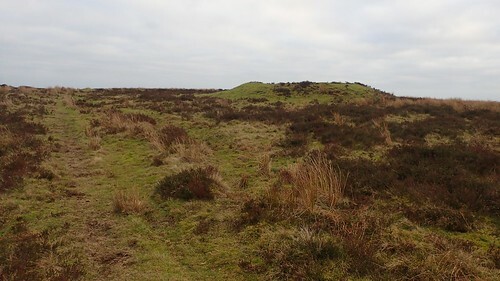 Green barrow? 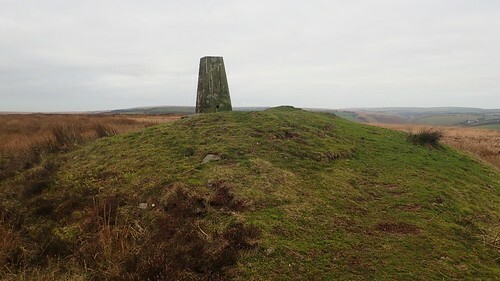 Green trig. 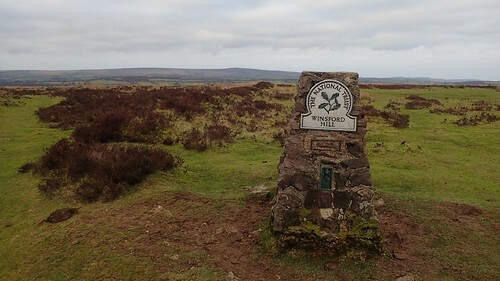 At 428 metres above mean sea level, this point is higher than many other hills across Somerset. 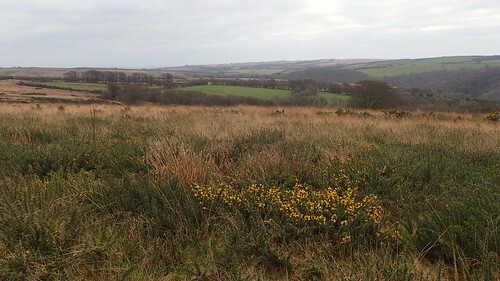 Yet it remains dwarfed by Dunkery Beacon – just visible to the right of centre in the photo above, along the horizon. 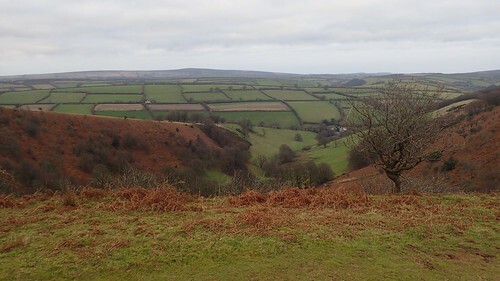 To reach Withypool Hill from here, we’d have to negotiate Knighton Combe, without the aid of any tracks of paths on that map that might provide a convenient route. Having set my compass for a bearing and begun to follow it, we followed a vehicular track on the ground that appeared to be matching my intended course. 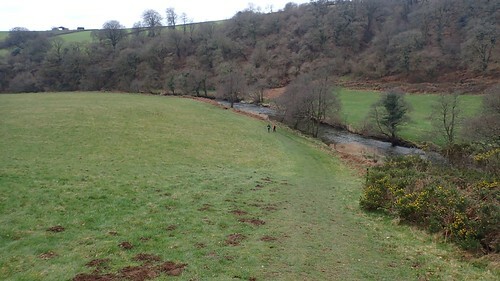 From the floor of the combe, we could then follow a private farm drive up to the road at Portford Bridge. 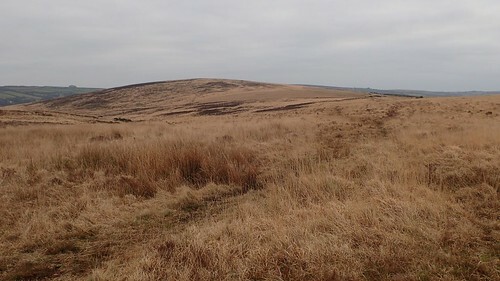 Withypool Hill – 398 metres above sea level. 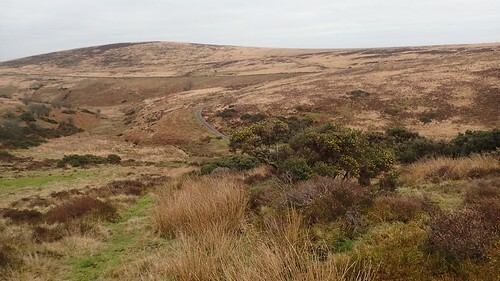 A path exists, running west-to-east across the heights of Withypool Hill. 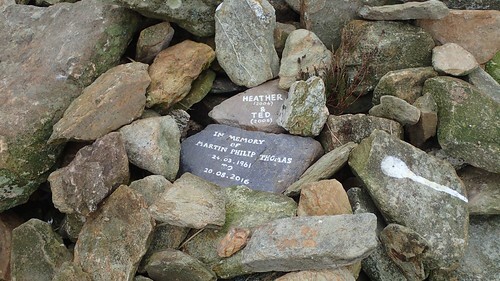 Not only did we find a cairn with memorial stones at the top of this one but there was a slight depression to the summit, allowing us to escape much of the cold but gentle breeze in time for lunch. Had I thought about it, we could’ve attempted a brief detour to find the nearby Stone Circle. Not that I would be expecting Stone Henge or Stanton Drew. 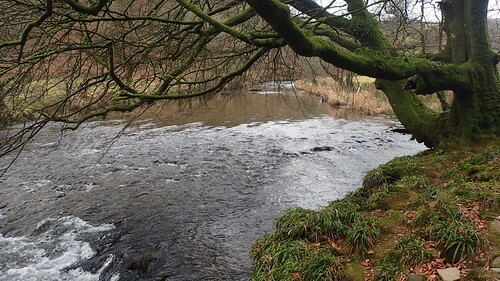 To the north of us, Withypool itself. 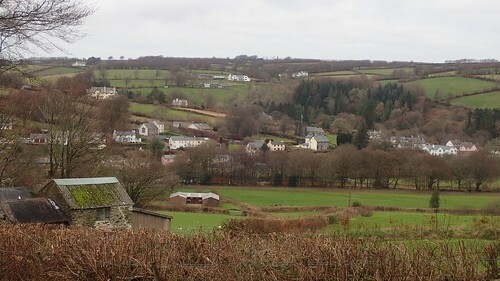 We wouldn’t be passing through this village, where the Exe Valley Way continues. 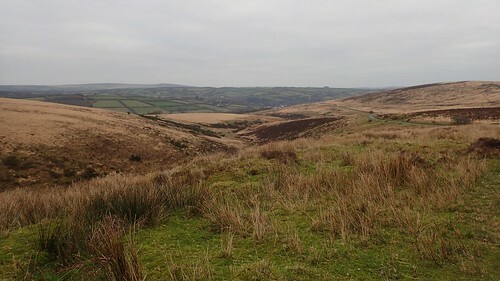 Descending the hill to the east, we followed another track, before turning north along a less obvious guide and then following a byway to join the road opposite Newhouse. From here, we’d walk east across South Hill, descending towards the River Barle… Before reaching the farm house, we’d find that the bridleway has been redirected (it did look official, waymarking and all) and now runs parallel to but not along the road, meaning that even the online OS mapping is out of date. 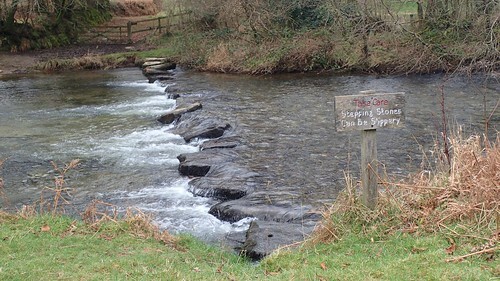 On planning this route, I noticed the ‘stepping stones’ marked clearly on the map… I’d expected something more like the flat and dry surface one can find at Dovedale up in the Peak District. Not like this! I was not as keen to actively lead the way across. One friend took to the stones with confidence, only to slip (whilst already on her hands and knees) around the halfway point and end up planked across two of the stones! Knowing that turning back was not really an option with her feet and legs already wet, she took to the water and forced her way across. Even with both of my poles out, I found these stones to be a hazard. I think I only got to the fourth one before I felt myself sliding off. 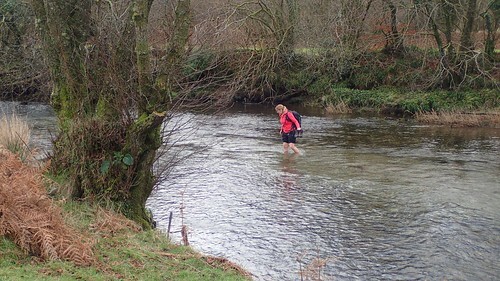 ‘Sod it’, I thought [I actually said something worse]; leaving the stones to wade my way across. Boots on! I’d advised my other friend to try the stone-less option. 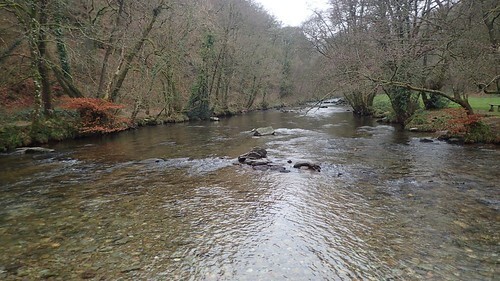 Our only other alternative was to head back up the path to the road, follow that through Withypool and then join the Two Moors Way further up stream, across the river. She had the right idea of removing her boots and socks. I knew it made sense; I couldn’t be bothered with the hassle of removing muddy gaiters and untying dirty laces. Then reversing that whole process on the other side! Wet socks or not, we were on the Two Moors Way, as intended. We followed the edge of the river for the next mile or so. A pleasant walk and I don’t think we saw more than one other person. 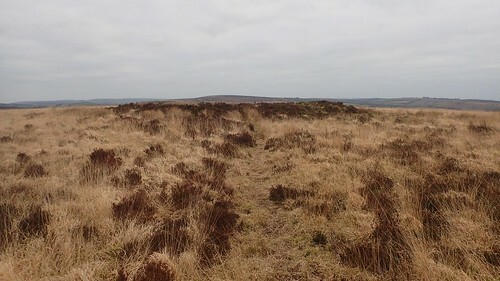 Just north of Bradley Wood, we would soon leave the Way and follow a bridleway climbing steadily towards Winsford Hill. It was quite a push up from Great Bradley before we’d step on to the open access land. While this was far from the most direct route back to the car park, I was keen to bag a second trig pillar and the extra hill would be good for us all. 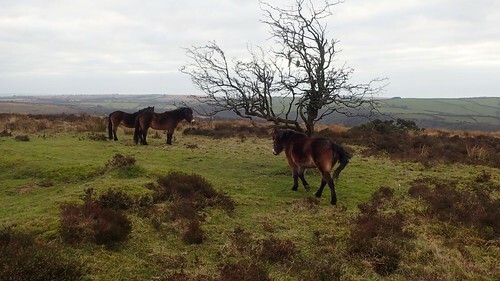 In spite of the road running along the top of Winsford Hill (an unattractive feature from which I’ve previously decided not to plan a walk here), Exmoor ponies graze much of the landscape. 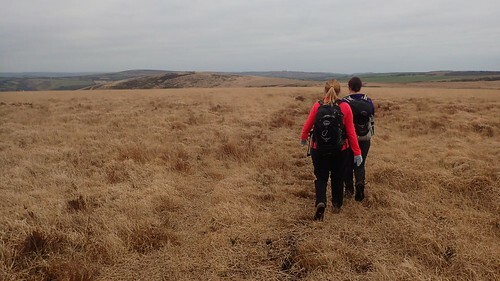 As with the quest for our first trig in the morning, there was no track to follow or guide us on our way. Initially, I kept us on the road and, when the opportunity arose, we crossed in search of a vague track that could be found running parallel to the tarmac. 428 metres above mean sea level. 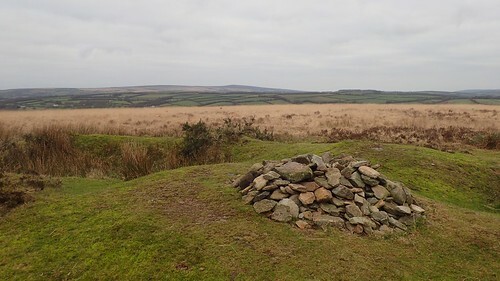 Behind the barrows (marked as ‘Wambarrows’ on the map), we found this stone-made trig pillar – quite similar to another that I’d bagged in South Wales over Christmas. There’s even a small parking area close by, for those who only like to drive up hills, perhaps. 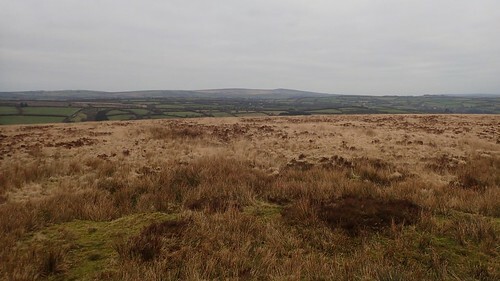 We walked on as far as The Punchbowl; a naturally-formed absence in the landscape. 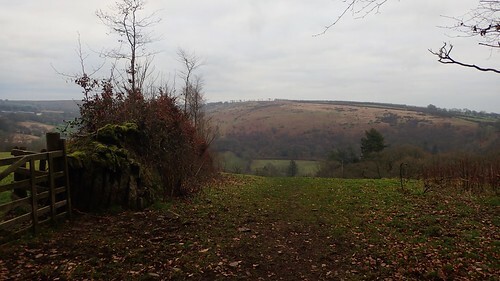 Days earlier, I’d watched a video of a walk on Blorenge near Abergavenny, where a similar feature was carved out by a slow rolling glacier, over thousands of years. 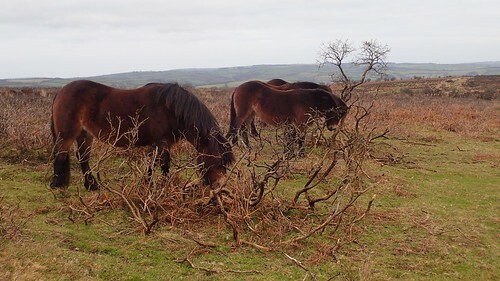 Here on Exmoor, this feature was more semi-circular than spherical or whole. 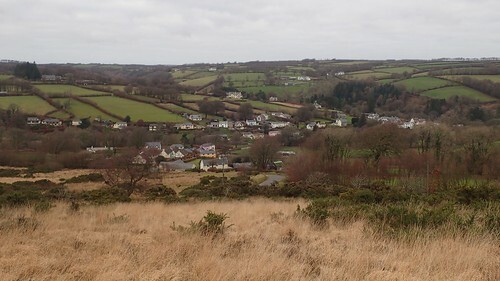 It’s possible that more of the hillside has been lost to quarrying. 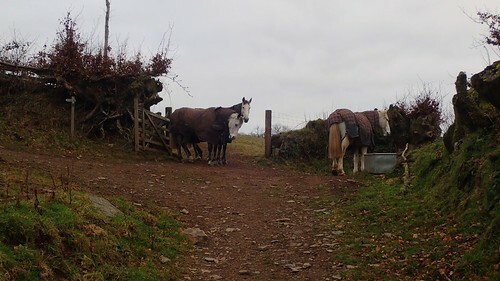 I was quietly confident that I could lead us from here, back across the road and on to our next bridleway. But I struggled to negotiate the myriad of paths from the top and had to resort to using the GPS on my phone (I was reluctant to walk far along the road), going off-piste at one point. 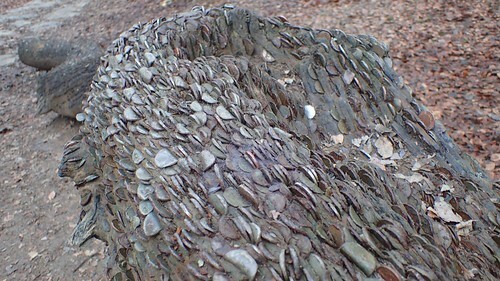 On a return visit, I would like to head further south-east and visit the Caratacus Stone. With the light beginning to fade just after 15:00 in the afternoon, we would descend towards Knaplock, following the bridleways and Watery Lane (which was actually stoney) to our riverside path, one final time. 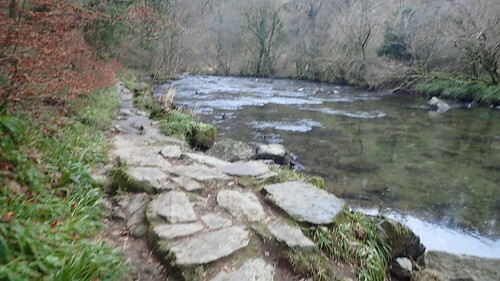 A riverside path of large rocks would lead us back to Tarr Steps; following the Two Moors Way one final time. 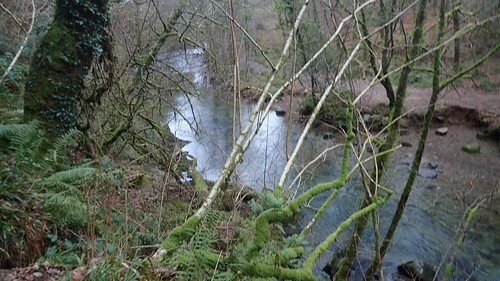 Shortly before the end of our walk, we encountered these fallen trees beside the River Barle. 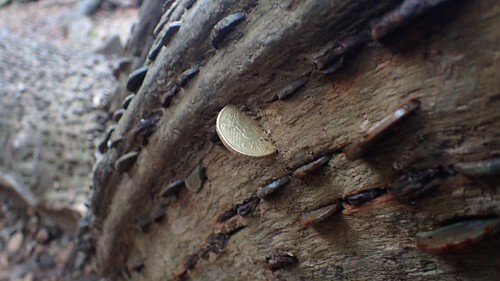 Studded with thousands of small coins. 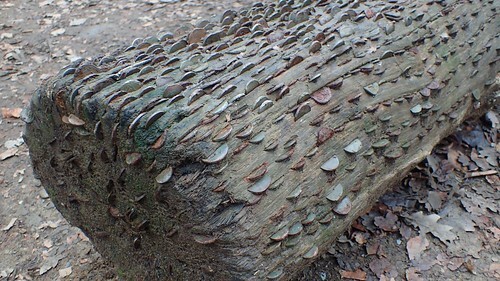 Mostly coppers and spare change but a few foreign currencies can be found, if you look very carefully. 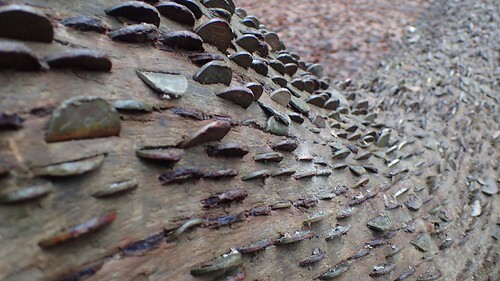 An incredible texture. 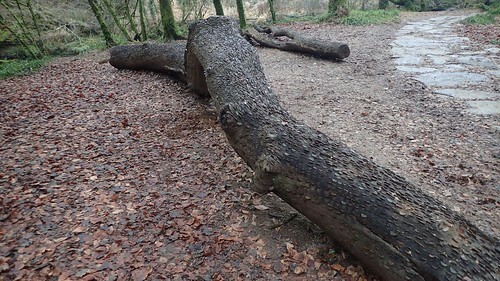 Such a beautiful linear and reptilian look to each log. 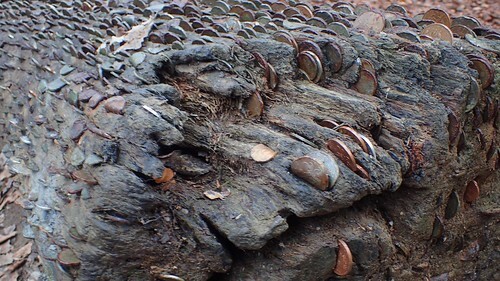 Much in the way that one might toss a coin in to a wishing well, visitors having been banging them in to these timbers with the hope of good fortune in return… Or, just to say that they’ve done it. 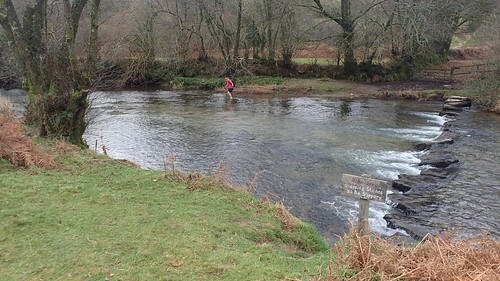 This is not exclusive to Tarr Steps or even Exmoor National Park – where I believe another example can be found at Watersmeet, further north and near Lynmouth. Beyond Somerset, this has been spotted in parts of the Peak District and north of the border in Scotland. 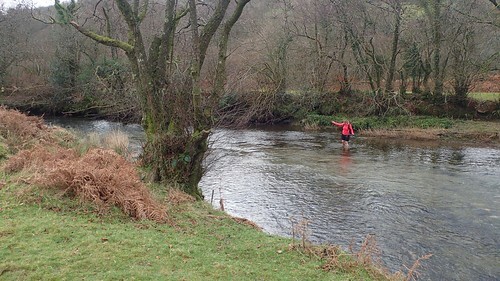 While many will come to Tarr Steps for a cream tea at the nearby pub and perhaps a paddle in the river, the three of us had enjoyed a good day out of many miles, several hills, two trig points and the adventure of river crossings, without having to fly to some far-off land.